Pace Wu (吳佩慈) and Singaporean songbird, Tanya Chua (蔡健雅) both attended Carven Fall/Winter 2013 held during Paris Fashion Week on February 28, 2013. Taiwanese star, Pace Wu (吳佩慈) looked pretty in a white dress with laser cut-outs from Carven Spring/Summer 2013 collection. A black clutch and lace ankle-booties to accessorize her look. 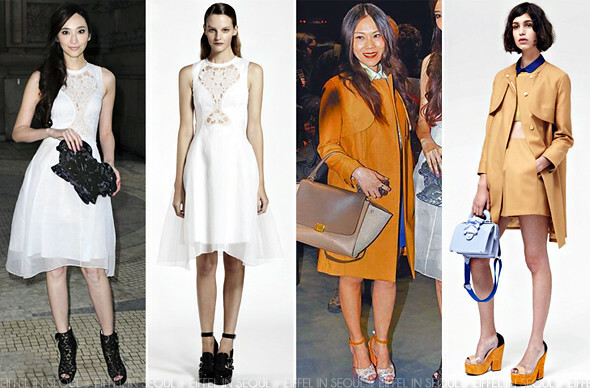 Songbird, Tanya Chua (蔡健雅) wore a mustard coat with a two-piece outfit from Carven Resort 2013 collection. A pair of matching sandals and Céline 'Trapeze' to complete her lovely outfit.